MOSCOW — Usain Bolt stumbled on the track, even almost fell down. Don’t worry, everybody, it wasn’t in the race. Jamie Squire/Getty Images With his victory Sunday, Usain Bolt moved to the top of the all-time world championships medals table with eight gold and two silver, edging Carl Lewis, who has eight gold, one silver and one bronze. No, this near-tumble happened in the middle of his celebratory dance, when a barefooted Bolt hammed it up after winning a third gold medal on the last day of the world championships. He even tossed his spikes into the crowd. And why not? He certainly didn’t need them anymore. His work was finished. In the very last race of the championships Sunday, Bolt grabbed the gold-colored baton for his anchor leg of the 4×100-meter relay and churned toward the finish line, huffing and puffing to generate more speed. Not that he needed it. Justin Gatlin couldn’t catch him. The rest of the field couldn’t catch him, either. Very few can catch him — he’s simply in a class by himself. Oh, he did that all right, winning gold in the 100, gold in the 200 and even more gold in the relay. With that, Bolt became the most decorated athlete in world championship history with eight golds and two silvers, moving past Carl Lewis (8 golds, 1 silver, 1 bronze) and Michael Johnson (8 golds). Overshadowed by Bolt mania was the performance of teammate Shelly-Ann Fraser-Pryce, who also won three sprinting events. She finished it off by breaking away from the field in the 4×100, easily beating an American squad that struggled to get the baton around — again. Originally finishing third after a bad exchange, the Americans were later bumped up to second after France was disqualified. Jamie Squire/Getty Images Shelly-Ann Fraser-Pryce also won her third gold medal, in the women’s 4×100 relay, giving Jamaica a sweep of the six sprint events at the world championships. 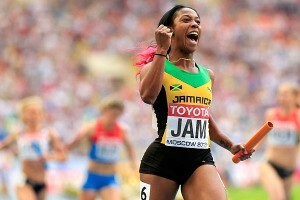 Still, the Jamaicans went 6-0 in the sprints against the U.S. in Moscow. These days, the proud sprinting nation owns this rivalry. “As a country, we should be elated,” Fraser-Pryce said. As a nation, the Americans may be searching for some answers. Sure, the United States won an impressive 25 medals. But only six of them were gold as Russia edged them with seven, making it the first time the U.S. failed to at least tie for the gold-medal lead since the first world championships in Helsinki 30 years ago. “Yeah, but look at how many young athletes we have on our team,” Gatlin said. Once again, the relays caused problems for the Americans. First, a botched exchange in the women’s race. Then, a stumble by Gatlin in the men’s competition. The night before, a shaky exchange in the women’s 4×400 final. The absence of Allyson Felix didn’t help. The eight-time world champion tore her hamstring in the 200 final and was unavailable for either relay. Felix did wish her team luck. “Said we were going to do great,” Jeneba Tarmoh said. They were off to a solid enough start, until the pass between the second and third legs. English Gardner took off too fast and Alexandria Anderson couldn’t catch up. Gardner had to apply the brakes. Anchor Octavious Freeman made up ground, but Fraser-Pryce was already way too far ahead. In the men’s race, the Americans were in a position to possibly give Bolt something he hasn’t had at these championships — a run for his title. That’s when Gatlin stumbled, stepping momentarily into Bolt’s lane after the Jamaican surged ahead. Gone was any chance of an electric finish. “I was able to collect myself, but it wasn’t enough,” said Gatlin, who beat Bolt in the 100 in London two months ago. As his team made their way around the track in a celebration lap, Gatlin half-expected a tap on the shoulder telling him the team was DQed. They weren’t. “I’m still happy the medal is still around our neck,” Gatlin said. Matthew Centrowitz had quite a performance in the 1,500, surging down the stretch to finish with a silver medal. His father, Matt, never got a chance to earn a medal in this stadium due to the U.S. boycott of the 1980 Moscow Olympics. Too bad his dad didn’t get to see the finish. The power went out just as he watched the race at a sports bar back home in Washington, D.C., and had to scramble to find out the result. • Christina Obergfoell of Germany won her first major javelin title. • Teddy Tamgho of France captured the triple jump with American Will Claye claiming bronze. • Eunice Sum of Kenya took the women’s 800 meters. Brenda Martinez of the United States was third. But as at most major meets, the day belonged to Bolt. It was his stage and he relished every step of it, dancing his way around the track to the point where he almost fell over. 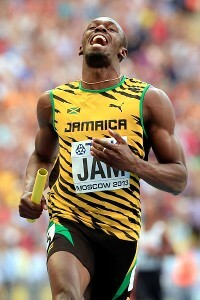 “I just went along with the music,” Bolt said.